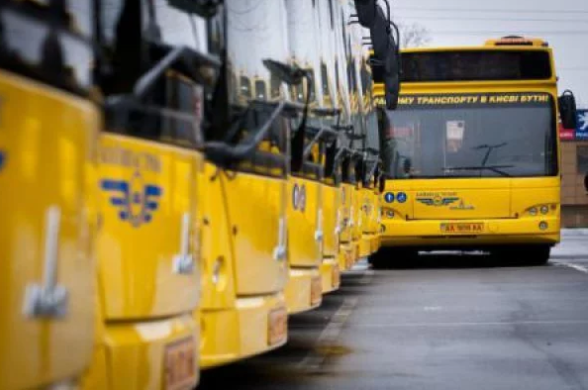 Kyiv furnished 220 additional buses of tourist operator’s to meet the fans at Boryspil airport who are coming to UEFA Champions League, as Yevgen Dyhne, First Deputy CEO of Boryspil International Airport, 112.ua correspondent reports. 220 buses from the tour operators will be involved during the days of charter flights arrivals and departure at Boryspil airport. Besides, Kyiv furnishes 150 new shuttles for the fans who will be going between the airports and fan zones. Five shuttles will be transiting fans from Boryspilska subway station to the airport. 200 taxicabs are expected to be working in at the airport during these days. According to Dyhne, usually, there are at most 140 taxicabs. Due to this, the second take-off runway will be closed as it will be rendered for a stand for the cars and shuttles. As it was reported, football teams of the UEFA Champions League final among women arrived in Kyiv. Besides, first groups of fans, guests and official delegations of the Champions League started coming to the capital. As it was reported earlier, Champions League final is to be held in the Ukrainian capital on May 26. Real Madrid and English Liverpool will meet at the Olympic National Sports Complex. Residential rent in Kyiv has gone up during the time of the big game. Prices might be a few couples of euros per night. Besides, there are cases when owners, who rented out housing couple of months ago for a regular price refuse the tenants and put their housing for rent for a higher price. Traffic on many central roads will be restricted or banned due to the preparations to men’s and women’s Champions League finals. Earlier, it was reported that Ukraine’s Government instructed the law enforcers to increase the level of activities on defining the potential threat of terrorist attacks in Kyiv and Kyiv region on May 18-28. It was noted that Ukraine expects around 50,000 fans during the Champions League final.